The ‘MAGMA’ system is a unique and innovative platform that enhances today’s approach to Medical Aesthetic Treatments. 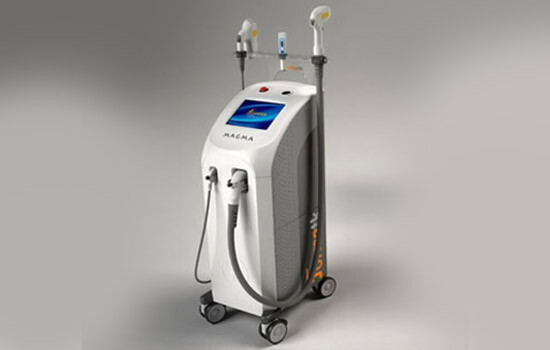 The MAGMA features a unique combination of an 808nm laser diode, 1064nm Long Pulse Nd: YAG and IPL technologies. 1. ALD – Advanced Laser Diode 808 nm Applicator The ALD applicator was specifically developed to treat Hair Removal in all skin types. Utilising Forma-TK's unique Diode Laser technology, the applicator destroys the hair follicular unit in a safe and effective way. 2. LLD – Fast and painless hair removal The LLD 808nm laser diode applicator was specifically developed to safely and effectively treat Hair Removal for all skin types. The large 4.5 cm² tip and fast modes of operation make the LLD one of the fastest hair removal solutions in the world.